With Valentine’s Day right around the corner, now is the perfect time to show your man how much you love him. Fortunately, giving the perfect gift doesn’t have to break the bank. To help you on this romantic journey, I’ve found 10 budget friendly DIY Valentine’s Day gifts for him that will keep you from doing just that. Not only will they show you went the extra mile by making something thoughtful, but they’re all relatively inexpensive (under $20) and super simple to make. Need money for gifts? Check out these 20 ways you can make money online before Valentine’s Day is officially here! You can’t go wrong with sentimental, easy, and affordable, am I right? Say goodbye to the cliche stuffed animal and candy and let’s find you the perfect Valentine’s Day gift to make your man feel loved this Valentine’s Day. If you want your husband or boyfriend to feel loved, this book will surely do the trick. 52 times to be exact! 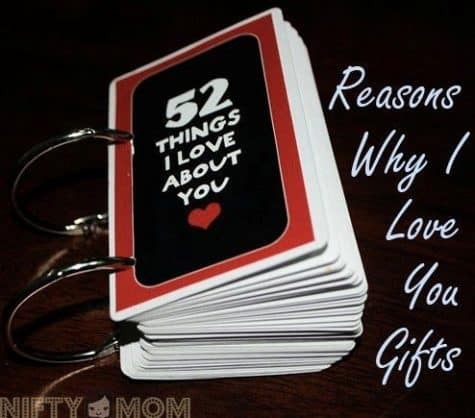 Find the tutorial on how to make a deck of cards into a flip book from Paper Vine and for more inspiration on 52 things you love about your guy, Samatha’s got you covered. 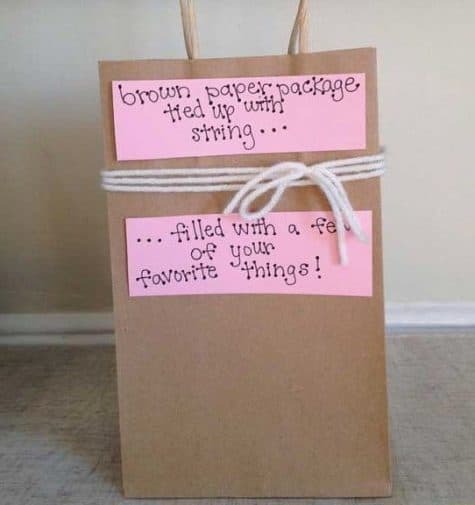 This cute idea will definitely make your man happy because who doesn’t love receiving their favorite things?! 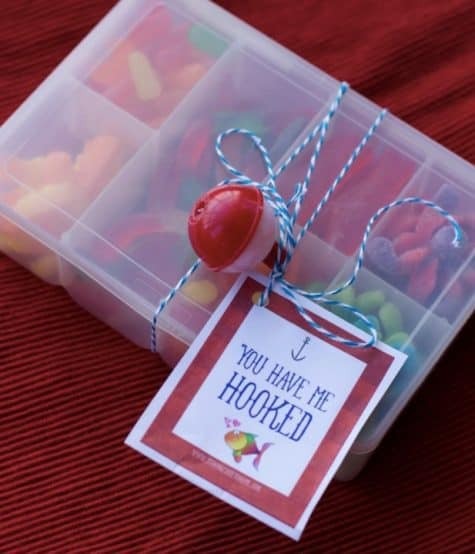 Fill the bag with simple items such as a photo frame of the two of you, his favorite candy or baked good, his favorite snack, his favorite movie for a fun, romantic movie night with just the two of you, coupons for a date to a baseball game or whatever his favorite sport is, and more. Thanks to the newlyweds cookbook for this creative and cute idea! This creative idea (an Adventure Fund) that comes from the movie Up is so cute and a great way to work hard towards something you can enjoy together. 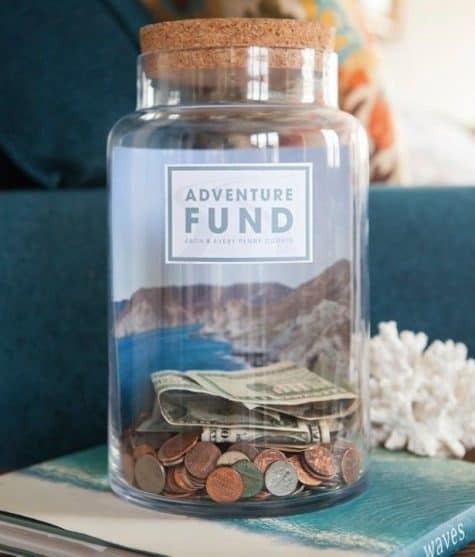 Decorate a cute “adventure fund jar” like this one from Something Turquoise and start the fund off with a crisp $20 (or more if you desire). Then the two of you can decide where you’d like your adventure to be and add to it throughout the year until you’ve reached your goal. The final result will be an awesome adventure the two of you can enjoy and make tons of memories from. Mara Yeager over at Super Savings nailed it with this gift idea. 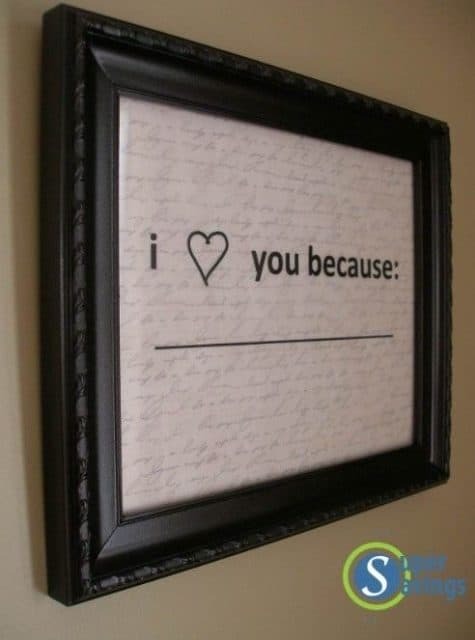 Give him this frame with a cute “I love you because _____” and fill in the blank! Then have your boyfriend or husband hang it somewhere where you can write something new each day. It’s the romantic gift that keeps on giving and he’ll always know how much you love and appreciate him. This gift idea from The Babes Ruth will guarantee you spend quality time with your man for the next year. She provides 12 detailed date ideas with everything you’ll need to create the perfect dates that are original and super fun. They are all affordable and outside the box so you won’t have to resort to “dinner and a movie” when you’re all out of cute ideas. 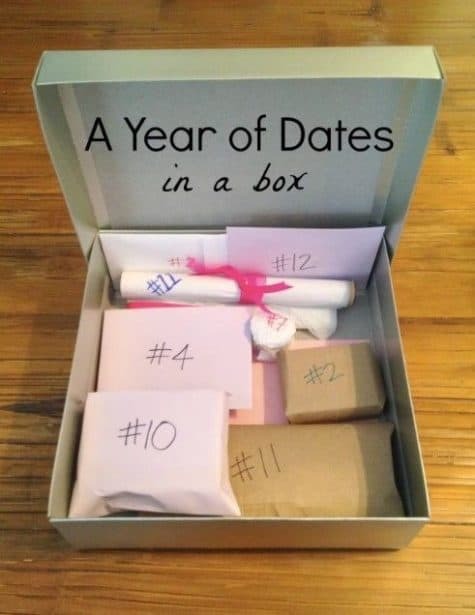 Find the tutorial and other creative ideas for your date box here. 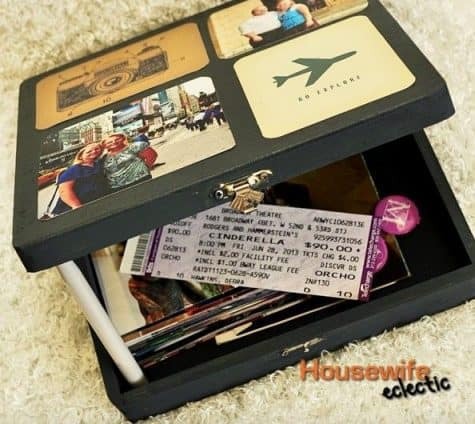 Decorate and fill a shoe box with memories (photos, ticket stubs, mementos) from all your favorite adventures/vacations you’ve been on with your guy. From last summer’s beach vacation to your favorite hike you accomplished together, he’ll love reminiscing on all your favorite memories together. You could even write little notes on the back of the photos about what you loved most from that memory/adventure. Find inspiration for decorating your adventure box on housewife eclectic. 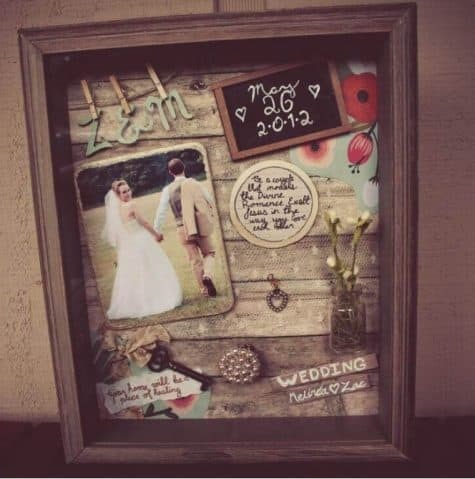 If you like the idea of the adventure box but would rather your man be able to display the memories to see for years to come, make him a romantic memory shadow box like this one from CueThat. If your guy loves fishing, this is the most perfect of the DIY Valentine’s Day gifts for him. It’s inexpensive, clever, a little bit cheesy (the best kind of gifts) and shows he’s got your heart. Close To Home gives us the tutorial on how to make this cute DIY gift idea. What guy doesn’t love yummy junk food and a movie night with his favorite girl? 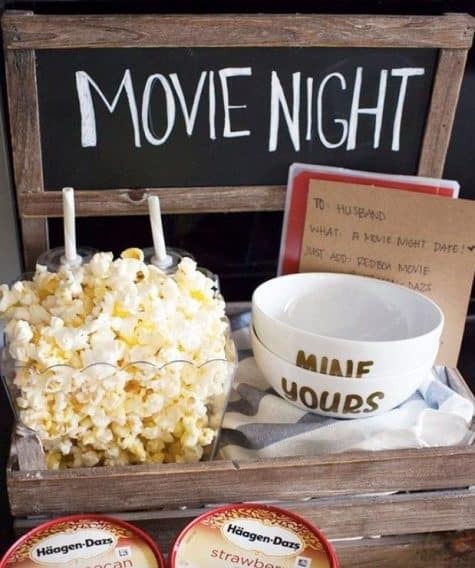 Create a “date crate” like this one from Joyfully Mad and pop in a favorite movie while snuggled up under a blanket with snacks in hand. Show your man your affection by giving him a coupon book of things you will lovingly do for him, such as breakfast in bed and a half hour back rub. The best part about these cute coupons is they’re FREE. 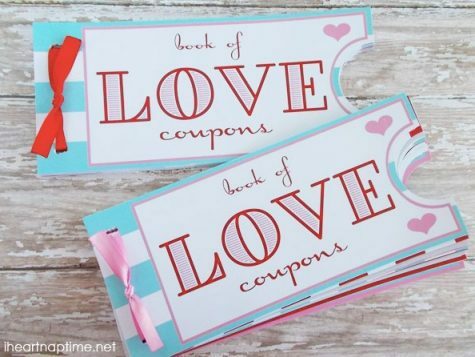 Head on over to i heart naptime to print your free coupon book for your man to gift this Valentine’s day. See? It’s not so hard finding DIY Valentine’s day gift ideas for him that are affordable and thoughtful. 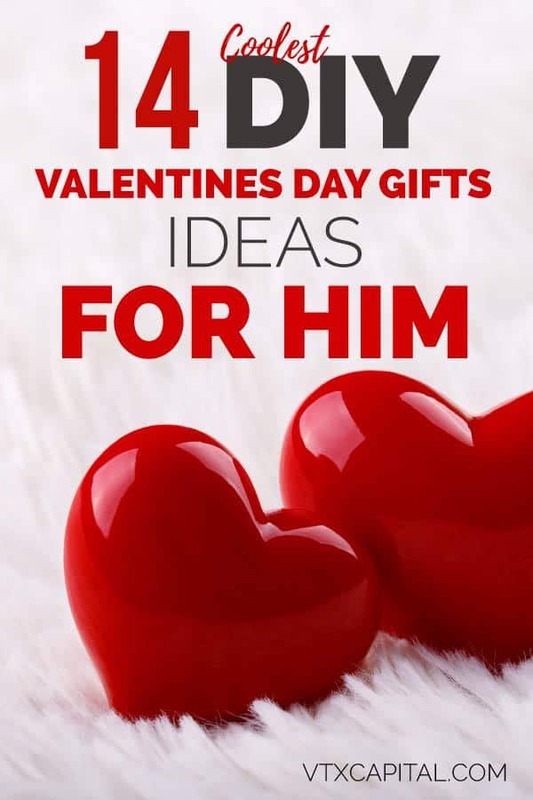 If you have any other DIY Valentine’s day gifts for him that you know boyfriends and husbands everywhere will love, feel free to share them below! Saving money, it turns out, can be a challenge at first. But, that doesn’t mean it’s an impossible skill to learn. Once you learn how to save money, it can actually become a bit of fun. 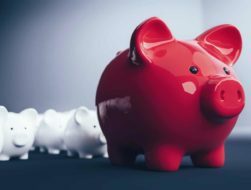 Here are 74 money saving tips you can start using today.